The underlying pathophysiologic process of nearly all diving is the compression or expansion of trapped gasses within the human body. Injuries can be further subdivided into either barotraumatic injuries or decompression illness (DCI). Barotrauma refers to tissue damage which occurs when a gas filled cavity rapidly changes volume, most commonly affecting the respiratory system as well as the air-filled portions of the ear. DCI, on the other hand, is caused by dissolved gasses forming trapped bubbles within the tissues. When a diver breathes compressed air at depth, the partial pressures of gasses dissolved in the blood and tissues increases. Under normal conditions, a diver ascends slowly, allowing the dissolved gasses to diffuse from the tissues and escape via exhalation. However, in the case of rapid ascent, the trapped gasses expand, forming bubbles throughout the body, most commonly the large joints. Diagnosis of SCUBA diving injuries is primarily clinical, based on characteristic findings during the history and physical exam. The chief complaint will typically indicate the organ system involved and specific care must be taken to specify the timing of symptom onset (i.e. descent, ascent, or after ascent). Important historical considerations include dive information (i.e. depth), type of gas used, recent travel, trauma, or stings during the dive, as well as past medical history including lung and neurological diseases. A focused physical exam should always include careful auscultation of the lungs and a thorough neurological exam. While labs and imaging are not always necessary to confirm the diagnosis, they are recommended for all patients with suspected decompression illness or cardiopulmonary symptoms. Initial investigations may include a chest x-ray, electrocardiogram, complete blood count, cardiac enzymes, and serum electrolytes. The Diver Alert Network (DAN) operates a 24/7 expert hotline for health care workers, and should be contacted for specific advice whenever a diver with a serious injury presents in the ED. The number is +1-919-684-9111. Ear complaints occur during descent and are the most common disorder experienced among divers. Patients may present with pain, tinnitus, hearing loss, vertigo, or facial nerve palsy. It is imperative to differentiate inner ear barotrauma from middle or outer ear barotrauma. By contrast, isolated middle or outer ear barotrauma is not a medical emergency. These can be diagnosed with simple otoscopic evaluation – middle ear barotrauma will present with an erythematous or ruptured tympanic membrane with conductive hearing loss, while outer ear barotrauma is characterized by petechiae in the ear canal without hearing loss. The treatment for both is analgesia and urgent outpatient follow-up with a primary physician. [2,4] In the case of a ruptured tympanic membrane, ciprofloxacin 0.2% auricular solution can be used to prevent infection. Pneumomediastinum generally presents with chest pain and subcutaneous emphysema (palpable air under the skin) of the neck and chest. It can most often be diagnosed with a chest x-ray. The condition is typically benign and self-limited; however, clinicians must carefully evaluate these patients to rule out more serious conditions including air embolism and pneumothorax. Diving at extreme depths or using specialized air mixtures can result in complications associated with high partial-pressures of inhaled gasses. Nitrogen, which is inert at sea-level, can exert a narcotic-like effect when divers journey below 30 meters. At high concentrations, oxygen and carbon dioxide become toxic, resulting in altered mental status and seizures. While dangerous at depth, these effects resolve quickly upon ascent and breathing of room air. No treatment is needed in the ED. Contact DAN for situation-specifics recommendations. 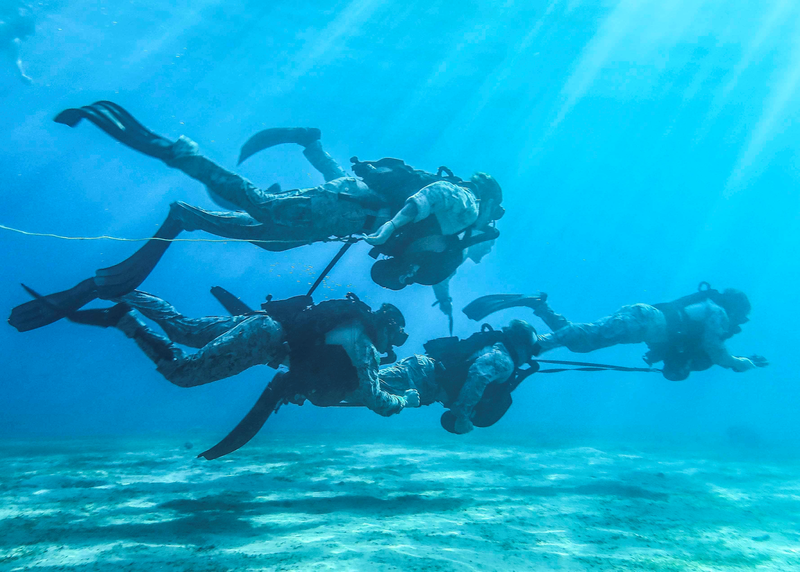 SCUBA diving remains a popular sport worldwide, and patients continue to present to the ED following diving accidents. The most common issues include barotrauma of the lungs and ears, AGE, and DCI. Important considerations include chief complaint, history of the dive, and timing of symptom onset. Physical exam should focus on the organ system affected, with careful attention paid to the pulmonary and neurological exams. Findings concerning for AGE or DCI should prompt immediate recompression along with administration of isotonic saline and 100% oxygen. Lastly, DAN should be contacted for situation specific advice whenever a diver with a serious injury presents in the ED. 1) Buzzacott P, Schiller D, Crain J, Denoble PJ. Epidemiology of morbidity and mortality in US and Canadian recreational scuba diving. Public Health. 2018;155:62-68. 2) Degorordo A, Vallejo-manzur F, Chanin K, Varon J. Diving emergencies. Resuscitation. 2003;59(2):171-80. 3) Vann RD, Butler FK, Mitchell SJ, Moon RE. Decompression illness. Lancet. 2011;377(9760):153-64. 4) Elliott EJ, Smart DR. The assessment and management of inner ear barotrauma in divers and recommendations for returning to diving. Diving Hyperb Med. 2014;44(4):208-22. 5) Sahn SA, Heffner JE. Spontaneous pneumothorax. N Engl J Med. 2000;342(12):868-74. 6) Moon RE. 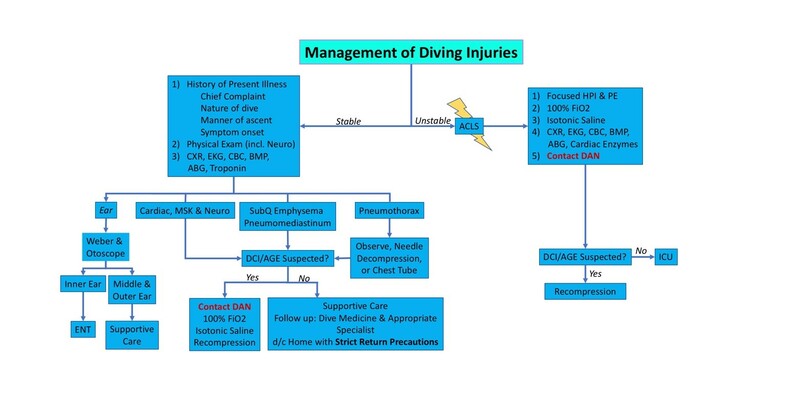 Treatment of diving emergencies. Crit Care Clin. 1999;15(2):429-56.